Dweebs, dorks, and dinkheads will tell you that the V-12-powered 760Li is Munich's American-market flagship. Poppycock. If you want to smoke your own hype, buy a bent twelve. If you want the real Bavarian road king, this is it. There are two kinds of people in this world — those who enjoy the glory of a sharply tuned V-12, and those who do not. We are firmly in the former camp (hell, we even built one for LeMons), but even so, we cannot bring ourselves to lust after the current crop of V-12 hypereurobarges. They're wonderful cars, but for our needs, most of them are simply too distant, too relaxed, and too heavy. Instead, we end up being drawn to stuff like this. The Alpina B7 is essentially a BMW 750i/750Li with 500 hp, 516 lb-ft of torque and a handful of minor body and suspension modifications. The added grunt is courtesy of reworked engine internals and extra boost; the 750i's twin-turbocharged 4.4-liter V-8 is fundamentally unchanged but gains larger intercoolers and different pistons. 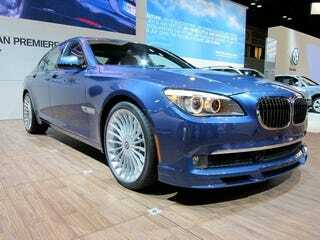 Twenty-spoke, twenty-one-inch Alpina wheels round out the package. A six-speed automatic is standard. Maybe we're a bit warped, but this strikes us as the coolest two-pedal car that BMW sells (or at least sells here). V-12? Psh! Liberty, freedom, and the limited-production, twin-turbocharged 'bahnsled for all!